Genuine Apollo Replacement Filters (2) for your Apollo turbine models: 800, 825, 835, 900, 1000, 1000SE, 1025, 1035, 1040VR, 1050VR, POWER-3, POWER-4, POWER-5 and PRECISION-5. 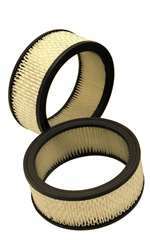 Replace filters as recommended in the manual and always use genuine Apollo brand filters for the best protection. Change your filters regularly and you'll be rewarded with many years of faithful service from your Apollo turbine. 2 x A4169 (6" x 2") round.